The Burdock Band is a sought after and award-winning barn dance band based in Birmingham, West Midlands, UK. 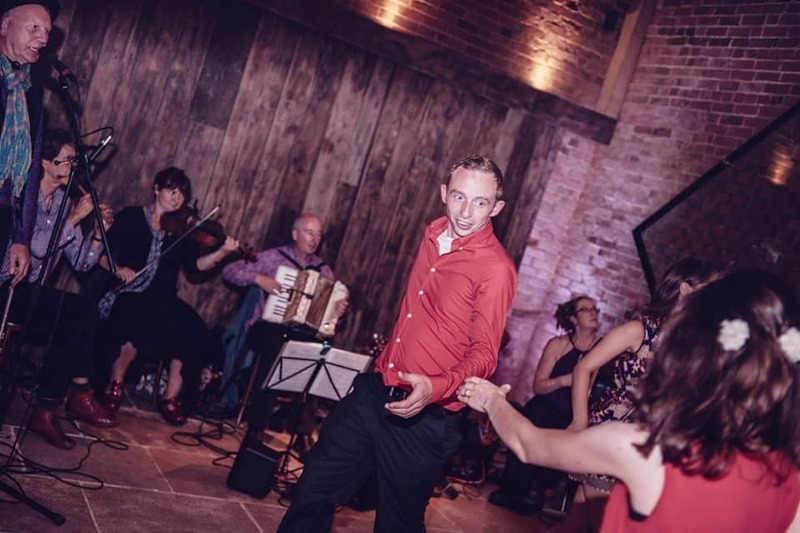 Our band comes complete with a professional barn dance caller who demonstrates and organises energetic country and folk dances accompanied by lively sets of traditional music and tunes delivered with a dynamic vitality. We play a mix of traditional folk tunes, original compositions and eclectic collections from around the world. We are proud to provide high energy barn dances at your weddings, parties, and events across the Midlands and beyond. Our light-hearted attitude combined with our infectious dance and driving music ensures that everyone has a great time. What Is a Barn Dance Band? A barn dance band provides one of the best forms of entertainment for parties, weddings and any other social event. Dances are structured like country dancing, only a lot more fun and in an informal ‘knees up’, anything goes manner. The band comes with a caller who instructs the dancers through the steps to give everyone a basic idea of how it is done. No prior experience required! What Type of Music is Played? Many barn dance bands play predominantly American and English tunes, but the Burdock Band has a reputation for its raw, earthy Celtic and European folk melodies. We’re very spontaneous in our playing and you may find the band improvising as we build up the energy and expectation. Your party will burst into life from the drummer’s first pounding rhythms as the caller gathers your guests onto the dancefloor . With the Burdocks, expect a high-tempo entertainment with infectious sounds that will get your guests moving. Whether you love the sounds and energy of a violin or fiddle or the array of guitar, bodhran, accordion, booking an authentic barn dance band means a night of fun, laughter and foot-tapping sound to the delight of everyone. If you’re planning a de-stress day, a conference, or perhaps a special event at your venue, we can recommend a barn dance as a great way for getting people mixing from different groups. Christmas parties, Burn’s Night, American Independence and St Patrick’s Day are also very popular dates, but book early! What is a Barn Dance Caller? A caller is a mix between a master of ceremonies and a dance instructor. Our caller’s main purpose is to “call”, or talk, your guests through the dance moves. It really doesn’t matter whether you are seasoned dancers, an absolute beginner, or one with 2 left feet, the caller will accommodate all. Why Have a Barn Dance? A barn dance is the ideal social event for all ages that encourages everyone to get involved. Its mixer dances break the ice by getting everyone up having fun together – there’s very few other entertainments that achieve that end. A ceilidh or ceili (pronounced kay-lee) is more of an Irish/Scottish type of Celtic affair. 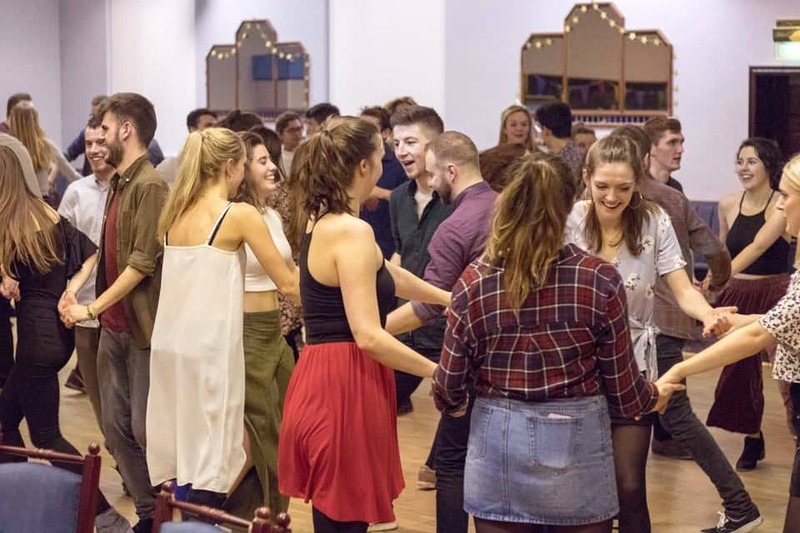 In the olden days, a ceilidh was a gathering where people in a community or family met for a good sing-song, tales, a few jokes, and dance, which is where the word ceilidh gets its meaning – “gathering”. In recent times, however, ceilidhs have come to mean purely dance. Check out our dedicated ceilidh band page for a more in-depth look at a Ceilidh and its origins. A hoe-down is a dance with an American theme, but whose dances and format are basically the same as a barn dance. However, the major difference is that a hoe-down gives the dancers more choice for dressing up as, for example, cowboys & girls. A barn dance is a mix of both a ceilidh and a hoe-down; it is sometimes described as the English version of a ceilidh. What Happens at a Barn Dance? Our caller will invite everybody on to the dance floor to walk through the barn dance steps before the actual dance begins. The caller assumes that your guests haven’t the faintest idea what to do. Once everybody know what they are doing, the caller will cue the band, yet the caller will continue to talk the moves until they are certain that the dance is working well. However, the spirit of barn dancing is actually to get it wrong, with everyone ending up in hysterics! There is a feeling of camaraderie that develops when people are learning something new: the crowd becomes a community as people let their guard down, and that’s the magic of barn dance. We arrive at least 60 minutes before the 1st dance set to make ready and sound check. For a typical event, we recommend 2 sets of 60 minutes, although they can be up to 90 minutes if you really, really want to dance! The absolute maximum performance time is 3 hours (including instrumental/incidental music and dancing). In the break, we can play background music through our PA as your guests catch their breath or partake in food and drink, before we continue onto the 2nd set. How do I organise a Barn Dance for a fundraiser? Assuming you have booked a public venue for your date, then promotion is key to success. When you go ahead and book us, we will support you through the process, particularly networking on social media. On the day, theming the space is key to create atmosphere. Some organisers bring in straw bales, but expect a mess to clear up afterwards! It’s good to put the band on a stage or rostra if possible. If you so wish, our caller can act as Master of Ceremonies (MC), and take a role in introducing your fundraising activities for you. What Age Range Is Barn Dance Suitable For? The great thing about a barn dance is that it is very inclusive: it’s suitable for people across all ages and abilities. There’s no upper age limit and it’s common to witness 3 generations of the same family dancing together. The Burdock band is a 5 member band with an array of experienced musicians playing fiddle, accordion, guitar, percussion and whistle/flute. The band size can vary depending on your specific requirements, be it budget, venue location, event etc. We can provide a singer if you wish to add some traditional songs to your line up. Our band is available for hire in Birmingham and the Midlands, although we will consider travelling further. Check out the map of our patch. If you would like to go ahead and book The Burdock Ceilidh Band for your event, or need some more information, please now contact us through the website enquiry form so that we can guarantee you a speedy reply. Make sure to check our availability calendar on our website to book the best dates.